Robert Finale Hand Signed and Numbered Limited Edition Hand-Embellished Giclee on Canvas:"Awaiting My Love, Riomaggiore"
Edition: Artist Signed and Numbered, Limited to 74 total. COA included. 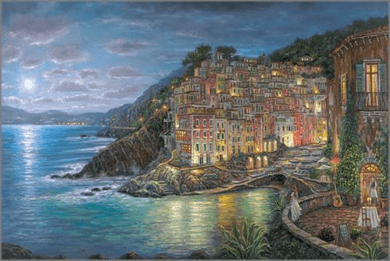 From the Art: Riomaggiore, the most breathtaking and eye catching of all the villages of Cinque Terre; Here, the timeless pastel buildings give off a romantic glow, as they seemingly march down a precipitous ravine, ever on their way to the tiny harbor at the end of their journey. In the distance, the moon dyes the Mediterranean in a rich warm glow; this also reveals the fishermen making their way home with their haul after a long challenging day at sea. Such a scene brings a smile to my face; it reminds me that such a peaceful way of life, not wanting or needing anything but the morning sun and the warmth of your loved ones at the end of the day, is not a distant goal here, but an everyday reality in this tranquil treasure by the sea.